What do we expect a non-expert to think this means? Does it mean he can use it in a different way? I still remember fondly the lady who called the hotel to find out if the “double use room” was cheaper than the double room because it would be used by two different sets of people before it was cleaned. It is surprising to find the enigmatic “doble uso” published so many times. Do you think that they will understand better what you are talking about if you say DUI? (it refers mistakenly to the bathroom products that for some strange reason some Spanish hoteliers describe as “amenities”). 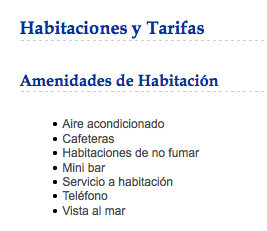 The right translation of “amenity” into Spanish is much more than just bathroom products. Air conditioning, for instance, is an amenity. 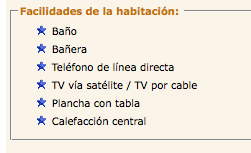 What would be the reason why in Spain, just in Spain, hoteliers call bathroom products amenities? In any case, the basket, the small soap bar and the rest would be “toiletries”. I ignore the reason of this strange use of the word, but it is a triple mistake: it ignores the words of the Spanish language, it deforms the English language and with it, they expect customers to understand what they mean. Some, although trying to giving it the right meaning, they are just happy calling it “amenidades de habitación” (room fun). Are they products that make your room more interesting and fun? facilidad. (From Lat. facilĭtas, -ātis). … f. pl. Special conditions that allow you to achieve something with the least effort. For instance , “facilidades de pago”, payment methods. Does it mean that they will allow you to pay for your room on installments? Every hotel or chain has its own different way to refer to their several room types, which makes the issue even more interesting. For instance, many hotels use without a problem the international words “superior, suite or junior suite” to refer to rooms that are more up the scale, however they still resist the idea of using the term “standard”, that would be the natural equivalent for the rest of the rooms. Maybe they just think it’s not prestigious enough for their hotel, as if standard meant vulgar. Many hotels have “superior” rooms but they come up with a new name for the “standard” rooms, which does not sound posh enough. No leo mucho los blogs por tiempo pero este tengo que decir que muy bueno y muy cierto. ¿porqué tengo que entender que en dicho precio la pueden ocupar dos personas?, puedo pensar que es una habitación de dos camanas y los precios varian si es para una sola persona o es para las dos. Creo sería más sencillo indicar que el precio es de esta habitacion de 2 camas y la pueden utilizar (dos personas y algún, si tienen algun niño que precio se adiciona o si tambien está dentro del precio de dicha habitacion. HABRIA QUE SER MAS CONCRETOS. Bien cierto es que debería cobrarse la habitación como doble, pero explícale tú al cliente el porqué y verás qué bien se lo pasan en el turno de mañana. Afortunadamente, algunas cadenas usamos el reclamo de segunda persona gratis para que no tenga que justificarse nada ni nadie. Todo un acierto. Me parece excelente el blog, ciertamente diciendo que lo que nos distingue en el mercado mas que el nombre o “nick” que le demos a nuestros productos, es nuetra diferenciación en el servicio…entre todo los demás factores que prelan (digase precio, localización, etc)…dejemonos de tanto tema y enfoquemonos en humanizar más el servicio que buena falta hace en estos tiempos que corren. Evidentemente hay que vigilar el lenguaje con el que nos comunicamos con los clientes. Las expresiones BB, HB, HD, late check out, etc, son muy complicadas para las personas que no están acostumbradas a la jerga y en ocasiones hay graves confusiones.